In very early morning of August, my colleagues and I walked to the center of Bamyan small city, where we were invited to attend the opening of a three days Women Handicrafts exhibitions in Women Bazaar. 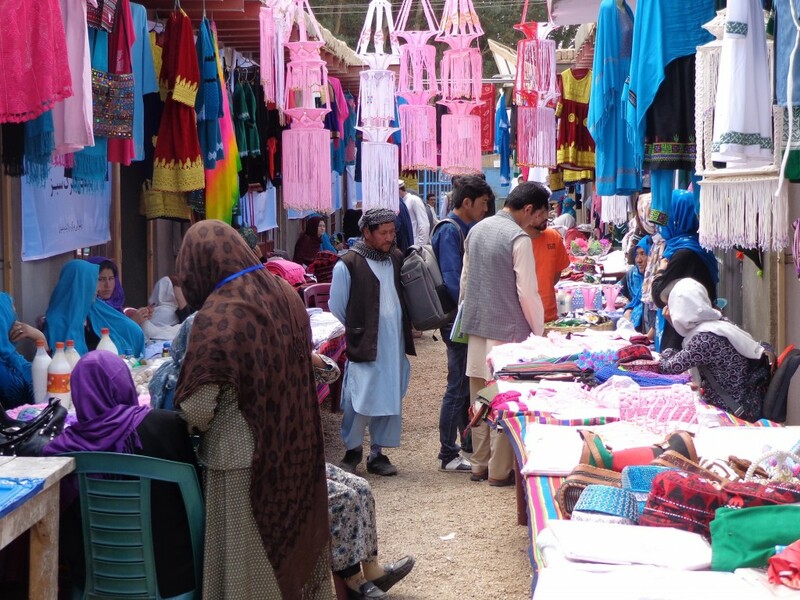 There is a particular place in the middle of Bamyan city so called “Women Bazaar”, which is dedicated to women businesses. In Women Bazaar all shopkeepers are women who run either independent business or in partnership with their family, friends, and local suppliers. 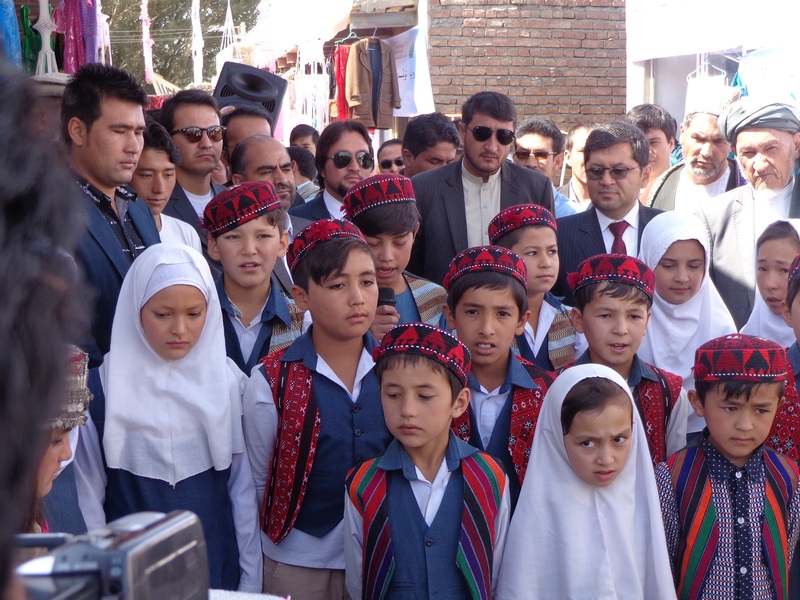 According to records by AREDP (Afghanistan Rural Enterprise Development Program), 20 small businesses and 50 production group from all around of Bamyan provinces participated in the exhibition. The items exhibited was a wide verity handcraft, dairy products, and local dresses which are prevalent in different districts. Dozens of women were selling unique embroidered Hazargi dress, decorative crochets, patchworks, rugs, woolen felts, woolen mantle and overall, felt-sandals, butter, yogurts, milk, cheese, Qrot (dried yogurts) and many other types of crafts and dairy products. 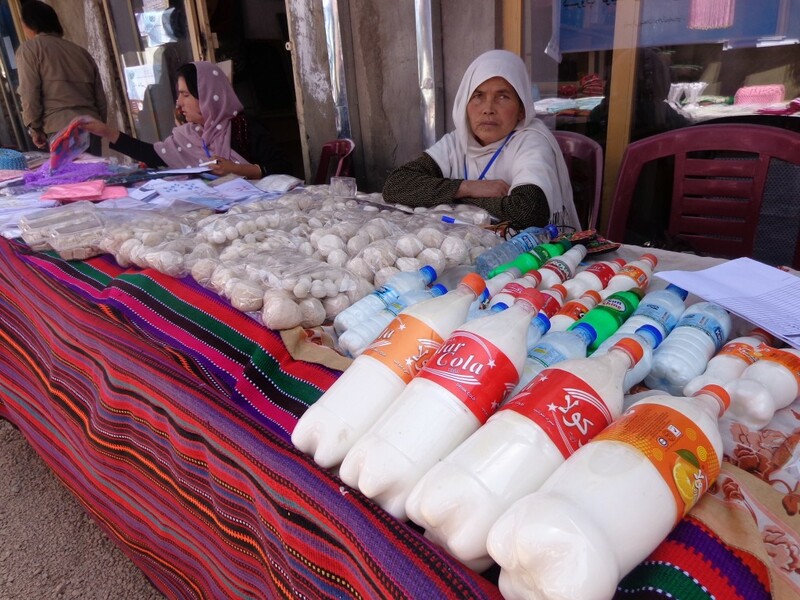 handicraft and dairy products are merely a women business in Bamyan. Embroidered Hazaragi dress, Hazaragi woolen mantle and overall are among finest and most expensive handicraft items in the region. But due to cold and mountainous nature of Bamyan, its ruined and undeveloped transportation roads, recent drought and increasing insecurity in neighboring provinces somehow deeply affected both handicraft and dairy industry. However, its recent tourist traffic, international and regional attentions and aids, diverted the declining trends of local products and ignited hopes to a better future. 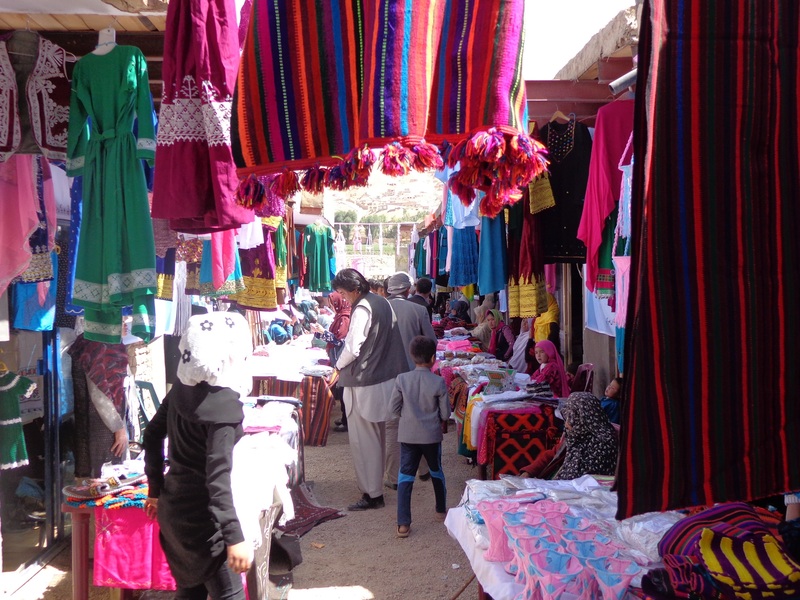 Latifa Safdari is a women entrepreneur, who collects women-made crafts like embroidered dress, napkins, pillow covers and decorative crochets from villages of Panjab district and trade it with retailers in Bamyan and Kabul. She believes that without effective protection policies and developing local markets and increase tourist visit, it is difficult for Bamyan craftswomen to revive Bamyan declining handicrafts industry. “It is saddening that women in Panjab work hard to produce these items but there is no local market available to sell their hand-made products. If they do not have any income in return for their hard efforts, how they could continue?” She said. However, Fatima Mohammadi, director of Noor Association which works on women empowerment, looks positive about future of women handicrafts. She says, a few years ago even imagining a women shopkeeper in Bamyan was a taboo but here we have dozens of women who sell all women-made products. As Bamyan attracting thousands of tourist’s attentions toward its rich historical and cultural heritages and natural beauties, women are also slowly getting to their rightful place in the Bamyan society. They are not only competing men in schools and universities but also in the markets, politics, art and cultural grounds of Bamyan.